Part of an interstellar gas cloud collapses into a spinning disk of gas. The gas and dust in the disk settle into a thin layer. During a few 10 million years it forms into planets. The Sun ignites. Formation of the Earth begins. There was a cloud orbiting around in the Milky Way. The cloud was very old, formed in the nuclear reactions of other stars long before our Solar System. In an astronomical sense this cloud was dense, a few million atoms per cubic meter. The cloud was still less dense than any artificial vacuum on Earth. It was a slowly rotating area about one light year across, slowly collapsing in on itself due to its own gravity. In about 100 000 years the cloud collapsed into a proto-planetary disc. Because of collisions in the cloud, the dust particles settled in a thin disc. In a rotating disc, the temperature and pressure in the mid-plane were higher than on the upper or lower edges. Additionally, pressure and temperature increased when getting closer to the rotational axis. The dust particles started to grow by colliding with each other, and started to become larger units, rocks. At the same time the star was forming at the centre of the disc, and its temperature rised to about four million degrees. This caused nuclear fusion to start; the Sun was born. 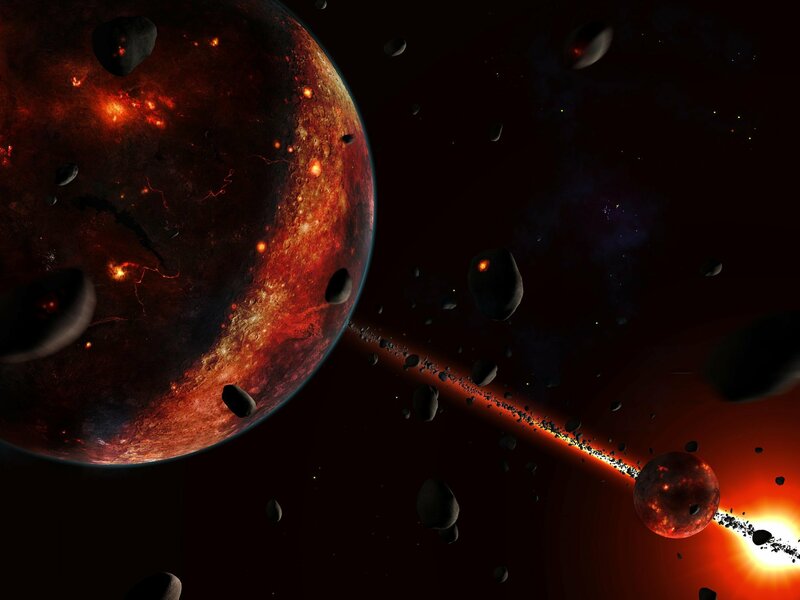 The age of Solar system has been determined from the ages of meteorites, pristine particles which have remained in the solar system since its beginning.